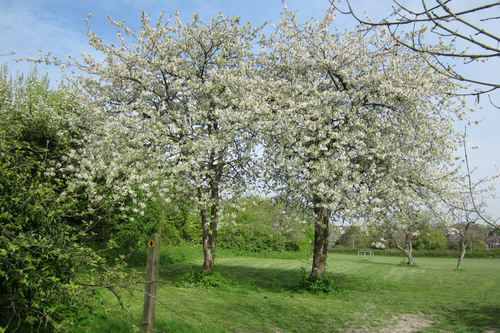 Steyning Community Orchard (SCO) was established early in 2014. A Steering Group was set up, including professional horticulturalists, biologists, retired business people and an arboriculturalist. We are all volunteers. Our objectives are to replant (hence help preserve) old Sussex varieties of fruit, help educate and promote to residents (both young and old) the health benefits of growing and eating fresh local fruit, to hold demonstrations and training sessions in fruit tree and orchard management, to hold community events in the orchard, and to investigate potential areas in Steyning where we could establish other orchards. One particular emphasis is to involve children in the Community Orchard. Apple Day is geared around them with apple juicing, story telling, craft activities and games etc. We also invite local Brownies, Rainbows etc to visit the orchard during Summer evenings for craft/story telling, and have 3 such visits most years. SCO Community Orchard on the Memorial Playing Field. This is an old Orchard that we are rejuvenating. We have a collection of Heritage Sussex apples here, as well as other apples, pears, plums, crab apples and quince. All the trees have been donated by the local community. Primrose Court Old Orchard, at an older peoples’ sheltered housing development in Steyning. This is another old Orchard renovation. There were originally over 50 fruit trees in this orchard, but few now remain. We have planted new apples, plums and pears. Steyning Downland Orchard, on the Steyning Downland scheme. This is a new Orchard specifically designed for Children that includes a Wild Play area. 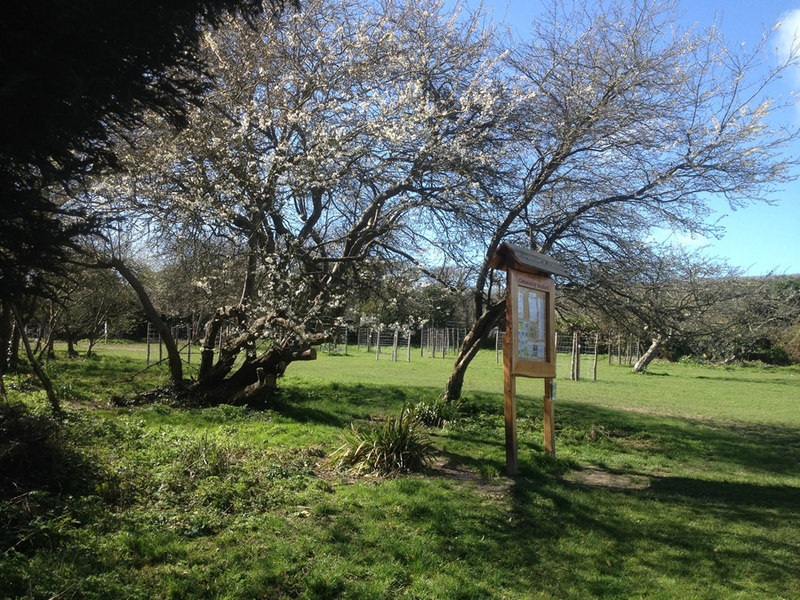 Bramber Community Orchard, at Bramber Brooks. A 40 acre area site adjacent to the River Adur consisting mainly of wetland. Part is being developed as a Nature Reserve. We were delighted to be asked to help set up a new Orchard in the driest part of this site. 15 trees have been planted so far.